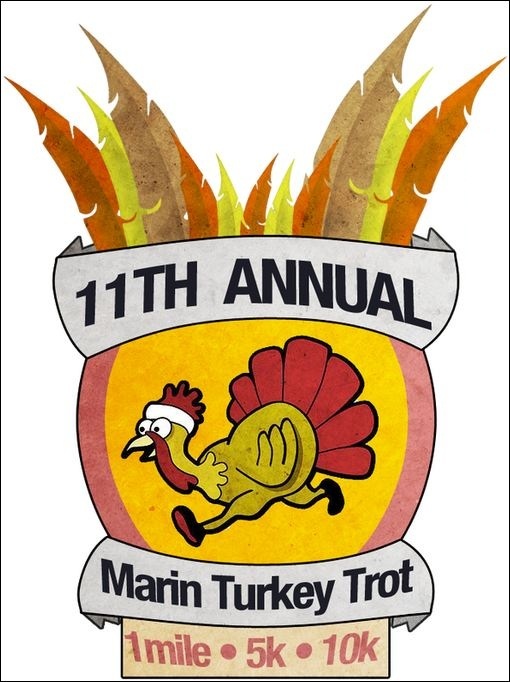 An ideal way to enjoy Thanksgiving feasting with a completely clear conscious is to run or walk in the Thanksgiving Day Turkey Trot in Novato. This is its 11th year, and it is set up so that the whole family can participate, with a variety of different types and lengths of runs. For younger kids and walkers, there’s the Youth Gobbler 1 Mile, while the Turkey Trot 5K is for aspiring runners. These two courses are on trails through Marin County Open Space. For the competitive runner, there is the Pilgrim 10K, which is a mainly flat, mainly on roads, out-and-back starting at the Indian Valley College of Marin campus, down Ignacio to Fairway and then about a mile down Fairway to the turn-around. The runs are a fundraiser for the School Fuel, the Novato Foundation for Public Education, and LIFT-Levantate, a non-profit supporting healthy lifestyles for low-income families. Sign up now to save on registration costs, and also to ensure that you get in before it fills up. Click here for registration information.